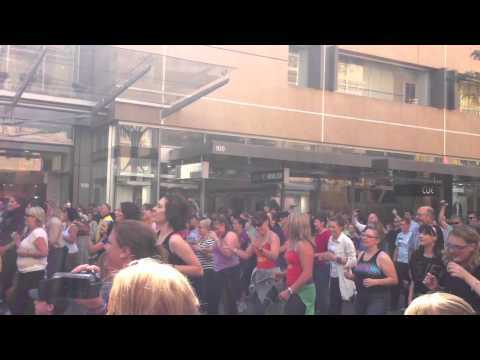 The No Pants Tram Ride is being run as part of something a lot bigger than the Adelaide Flashmob! The No Pants Subway Ride is a global event started by Improv Everywhere in New York in 2002. Check them out at http://www.improveverywhere.com! WHERE: Meet at Hindmarsh Square in the city, we’ll finish up at Glenelg. The Annual No Pants Ride is here once again. As usual, we’ll be joining thousands of people all across the globe on this epic day! The idea’s simple: People on the Glenelg Tram are going to be surprised when people with no pants on get on the tram at stops all along the way to Glenelg. 5) When you’re on the tram – with no pants – it’s important that we pretend that nothing’s out of the ordinary. Now, if you’re thinking that there’s no way you’re going to ride the tram pants-less consider this… Improv Everywhere run this event every year in New York and last time they managed to get over 3000 people, That’s Right OVER THREE THOUSAND, to go pants-less and for them its the middle of winter. In the Aussie summer going pants-less is actually more comfortable than wearing pants. This is going to be an awesome day. Tell your friends about it by clicking the ‘share’ link. If you’re interested in Attending but don’t want to remove your pants, we have a number of active support roles to be filled. Note: This is not a Ride to Maslin Beach… so wear Underwear or else! Note: All normal Undergarments are allowed provided that it is clear that it is underwear. YOUR ASSISTANCE WILL HELP MAKE THIS EVENT A SUCCESS!